Someone's been a very naughty girl. Egyptian cottons, bought at the Scottish Quilt Show. It will take ages to get round to using them, but they had to be had. They were incredibly cheap and the colours are radiant. I also picked up some more perle cottons from the Avery stand just because. I heard about this - a Scottish Quilt Retreat!! - from Jo Bearpaw Avery. It sounds great. Just like the last show at Ingliston, my M-I-L and I were probably among the youngest people there and the quilts were mainly very traditional - it's not that there's anything bad about that, but it would be nice to see some more modern quilts too, just because a good mix is stimulating. 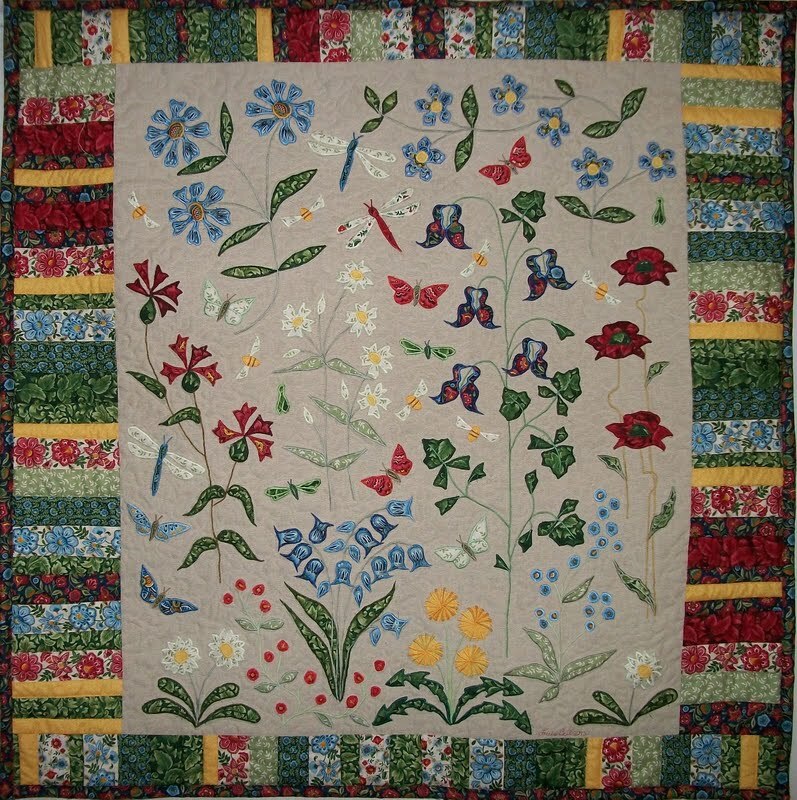 The skill involved was amazing, and this, My Garden by Louise Bell, stood out for me because the fabric for the flowers, leaves and insects was beautifully fussy cut to create different shades and textures, and I love the dandelions! This photo (c) Louise Bell, http://www.louisebellquilts.co.uk/, all pics used with permission. oooh! I love your rainbow of fabric and thread. That fabric is divine! And those flowers?!?!?!? Amaze-balls! Oh lucky you, if you end up going to the retreat! You're not naughty - just you love colour and fabric! Catherine I have not seen either of these lovely fabrics or cottons in real life so I can imagine they must have been very inticing. Lovely to have you post this week. Don't feel like you have to rush to use them, they won't expire! ;-) Rainbows never go out of fashion! I love yoru new fabric and thread! Oooh! What. Yummy looking stack! Unavoidable I'd say! I love "My Garden" ! That's a gorgeous gorgeous bundle! So radiant and merry.